Moving out on your own for the first time is exciting. You are in charge of where you live, what your place looks like, and how long you’ll live there. As exciting as it is to get a place of your own, you shouldn’t rush into a lease too quickly. There are some things to know before renting your first place. Before even making appointments to view rentals you should be looking at your finances. Do you have a good job? If you do, renting an apartment or house might be within your means. To know for sure, though, you should consider what your budget might be. Add up monthly food costs, health insurance, gas for your car, utilities, and all the other expenses you’ll have. Leave off the rent payment, for now, until everything else is added up. Now compare that figure to the take home pay from your job. If there’s enough money left over for rent, you’re ready to go look for your first place. But if there isn’t, you’ll need to either find places to cut your budget, or wait to move out on your own. Realizing you can’t afford a place of your own is a bummer. Still, there is a point when mom and dad’s financial support needs to end. Sometimes location plays almost as big of a role in choosing a rental as the amount of the rent payment. For instance, are you planning to walk, drive, or take a bus to your job each day? If you’re walking, you’ll want an apartment that is close to your job. On the other hand, rentals near your work could be out of your price range. But if you’re driving to work you must also consider the distance to and from work each day. Driving too far to work will cost you more money on gas for your car. Taking a bus or some other form of public transportation may not cost you that much. However, it does come up short in convenience. Keep that in mind as you choose an apartment or home to rent. 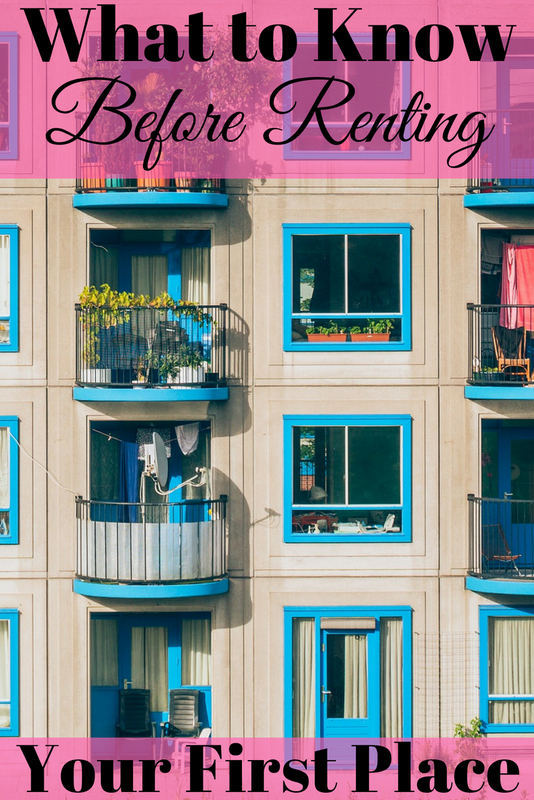 Of course, your monthly rent will be dependent on more than just location. There’s also the newness of the building and amenities to think about. As examples, ask these questions: Is there a carport? What about a pool? Will you have your own laundry facilities or a shared one among tenants? Do they allow pets? Any of these items can drive up the price of your rent so that it’s unattainable for you. Don’t forget to take into consideration the size of the rentals you’re looking at. The number of bedrooms, and their sizes, will also determine the amount of your rent. When it comes to renting a house or apartment, there are some ways to make it more affordable. As hinted at before, having pets will cost you more. That may mean giving up your furry friends or leaving them with mom and dad. Another way to make renting fit your budget is to get a roommate. Sharing with a friend might make a nicer place more affordable than living there alone. Knowing what’s included in your monthly rent will impact your budget. Some rentals will include all, or a portion of, the utilities. That allows landlords to ensure yards are watered and kept up properly. The last thing you want after signing a lease and moving in is surprise bills you weren’t looking to receive. That’s why what’s included is important to know before renting your first place. Usually there’s an inspection or “walkthrough” that happens before you move into your new place. When it’s offered, don’t sidestep it. Make notes or take pictures of holes and nails in walls including their location. If there are any stains or tears in carpet, record that as well. Otherwise, at some point in the future when you move out, you could be charged for those damages. Taking the time to complete the walkthrough can save you money when you move out. In fact, according to Allstate Insurance, the walkthrough is one of the most important parts of moving. Moving into your first place is an exciting time in your life. However, as you can see, there are some things to know before renting your first place. Have you started looking at rentals and had a few surprises? If so, what were they? What is better? Renting or leasing? Well, that depends on each person’s individual situation. For example, how long will you be staying in that area? If only a short time, perhaps a short term rental or month to month rental would be best. A lease is usually for six months to a year at the minimum. If you’re only staying a few months you might find it hard to break your lease. I’m glad it could help! Thanks for the feedback! Don’t forget to ask the utility companies for estimates of the bills. Some places will be more expensive for utilities depending on the age of the appliances, central air and heat vs window units, insulation in the walls and in the attic, the quality and seal of the windows and doors, etc. A well insulated place will save you money. That’s a really good point. 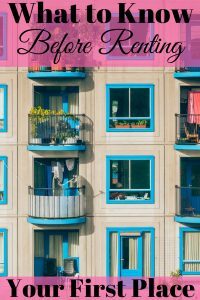 You should always find that out before renting or buying a place.